Brooke's art was chosen to be displayed again! I love the creative touches she adds! Alisa came down with the low pony tails and choker and totally reminded me of my sister, Michelle, when she was in middle school. She is growing up. Also, who let chokers come back in??? Jake's hair is longer than ever, and he frequently requests for me to curl it. I think it is hilarious, and it actually looks really good! Jake decided to try parkour in the off season of hockey. This was just the beginning of his practicing. He has loved it. He gained courage on the trampoline and is doing all kinds of back and forward flips and twists. Brooklyn's art was chosen for display in the Museum again. She is getting really good. I love her details that make her projects stand out. Alisa came down dressed like this and I immediately thought of Michelle's 7th grade picture. She has her own budding sense of style. I just keep wondering how chokers came back into style! Throw back to when I was 14. I can't believe my baby Jake is 12. And yet, I can. He is a man-child. He's been shaving since he was 10 (almost 11), his voice is low, and he has a six pack (he's pretty proud of that!). Time has flown. This boy is handsome. He can charm the socks off you. The life of the party, always up for a party, quick-witted, hilarious, prankster. He is getting good at the piano and has discovered that girls think it's pretty awesome when you can play pretty songs. I would say he's discovered girls, but that has been from day 1. He decided not to have a birthday party (because "12 year olds don't have birthday parties") but had a fun night with his friend, Ryder. 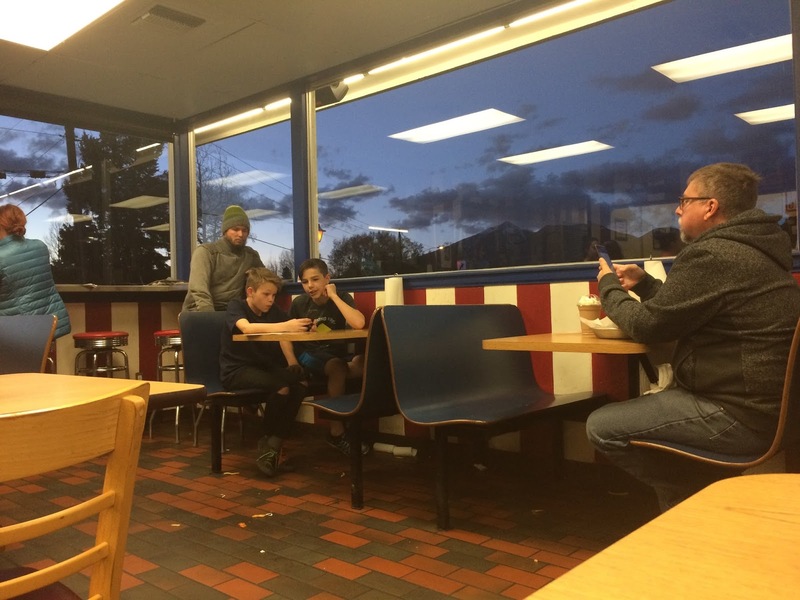 We went to Mama Burger and they sat alone, then came back and watched a movie. Sunday morning was his birthday and he got a trick bike and mountain bike, and a geode from Brooklyn. Andrea Romney's family (Savannah is his age) left him a candy gram, and Tarah got him a bunch of junk food, including a regular Dr. Pepper. He was in pre-teen heaven. He ate monkey bread for breakfast (along with all the junk food) and walking tacos with Doritos for dinner. I sure love this boy. Scott and I attended the temple separately in April. I zipped down to Phoenix on a Friday. It was perfect. I love the feelings of peace and calm that I get when I go to the Lord's house. Scott, Josh, and Gene sang Treston's favorite song for his baptism. Gene jumped in last minute and was pretty awesome with those harmonies. Grandma gave a phenomenal talk on the Holy Ghost. Treston asked Jake to play the piano while he and Josh got dressed. He did a fantastic job. He practiced on his own for a few weeks in preparation. Scott and I were so proud! It was a very special day. Tonight I felt crazy. Somehow, as I was trying to study with Jake, the cousins came over and started playing Battleship next to us. The party music (rap and heavy metal type) was blaring from Pandora, and I was trying to make dinner as well. Isaiah came over an hour early for scouts, and a game of hide and seek/tag/nerf wars ensued. It calmed down a bit when the boys left for scouts. The girls were finishing homework, and having very animated conversations on their calculator cell phones. Alisa's clients were all presenting her with math problems, and she was practically yelling at them how to solve them, and why... all while solving her math problems. It was a bit weird. Then Brooklyn starts yelling that her customer can't call twice in one day! She put them on hold and turned to us in all seriousness. "Do you know how to get rid of a manatee in someone's backyard?" We were dying laughing! She then yelled at the calculator that they need a professional exterminator! "You can't ask for so many things! Stop calling!" She then calmly and loudly told us she was UPS and the exterminator, but apparently not the professional one needed for a manatee extraction from the backyard. Oh, man, we were dying. Those girls! Yesterday, Alisa was Brooklyn's horse. Brooke really was riding her around on the hard floor downstairs and having a grand old time. On a side note, our pubescent son comes down in his boxer briefs every night to give me a kiss and hug. I love him for it, and I find this hilarious! Totally unabashed. Just his tighties. Not a care in the world. He was also caught texting Savannah (Tarah's sister's daughter) at 12:30am on New Year's. Sheesh! We've got a teenager on our hands. I should probably write, for the record, that Jake started shaving the day before he turned 11. He had the need for a couple of months, and when it happened, he would not let me document it in any way. So. He's been shaving for almost a year! Yesterday was possibly the most perfect Sunday ever. It was stake conference. We left uplifted and inspired to be better, to serve more, and to live like our Savior. After lunch, we loaded up bikes, snacks, and kids (no small feat here!) and drove out to the Ft. Tuthill bike park. They were having some kind of race and there was a huge crowd. We left there and drove to Marshall Lake (it's a bit of a marsh right now). We set up our hammocks and read and relaxed, rode bikes a bit, and dozed for awhile. At Jake's urging, we went back to the bike park, which was now empty. The kids and Scott had a great time. I even tried it once. Brooklyn, poor girl, had a fever all day so we hung out in the hammocks together. She was all bundled up and was a trooper. We got back and had eggs and bacon for dinner, then got everyone into bed. We all went to bed feeling so fulfilled and happy. Jake and Alisa declared it the best Sunday ever. Scott didn't even feel the Monday-eve blues he usually gets. It was a perfect day. (1,2,3.... ) We're Diaper free!!! 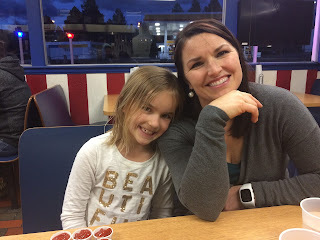 From a Dad to his kids; Things I want you to Know! Look who turned 6 months old!